After you have settled down following a whirlwind of activities that result from the birth of a child, you decide to take a holiday and relax. At this time, you are probably preoccupied with deciding on what you need for the baby and what you should carry with you. Moreover, your means of transport will also affect the list of thing to carry and pack. Here are few baby safety tips that can help make this easier for you. Most importantly, make sure to carry sufficient amounts of baby formula if you are bottle feeding. What Must I Eat In Pregnancy? Also, carry plenty of water in containers that will keep it hot and carry lots of bottles. If you are breastfeeding, it’s much easier; you can stop at regular intervals to feed the baby. You will also need to make sure that you carry healthy food for yourself as fast food and junk foods would affect breast milk and can make your baby sick. Apart from baby seats, which is just one of the many baby safety items, babies and children below eight need to be strapped in booster seats. The other safety items you would need are a baby sling or backpack carrier; this will help you when you are taking walks or travelling a lot. This is also easier for you and your baby when you are on a flight and do not have a ticketed seat. If you are carrying a baby seat, strap it on to the seat of the plane with the help of the flight attendant. Also make sure to carry a stroller with you; carrying your child for long periods will tire you. A light weight stroller is easy to haul around. Strollers are efficient whether you are traveling by car or flight. 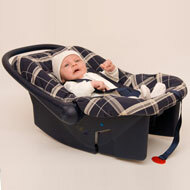 Baby safety gates are something you should take into account when you want your baby to be safe. Most of them are pressure mounted and can be fixed wherever you need it, either against a door or a wall. These are transportable gates; for your home, you should opt for the permanent ones that are screwed and attached. Ensuring the safety of your child also means carrying common medications that your baby might need in case of emergencies. Finally, it is always better to carry your own baby travel gear, even if rented items are available. In sum, keep enough food, carry baby seats and booster seats, carry essential medicines, and always keep lots of water with you.